One of the living national treasures, Yaokichi Tokuda III, passed away on Aug. 26th. 2009. Pneumonia killed him. He was 75 years old. Yasokichi Tokuda III was one of the best potters in the Kutani area. He developed 100 colors from the basic Kutani colors: Yellow, Green, Blue & Purple. His blue color is very famous. His gradation color from Blue to Green to Yellow is very beautiful. This gradation can be seen in his many works. So, his works will never be made again. Their value will not drop, but will increase year by year. Of course, it will be increasingly difficult to purchase his newer works from my vendors. My dad has one of his vases and a sake cup. I should inherit them. They are my family’s treasure! I'm very sorry about Mr. Yasokichi Tokuda. But I'm glad to see you're continuing to write your blog! Best wishes from Croatia! I am also very sorry about his passing. He was a great man. Thank you for reading. Please come back. It is a nice article. 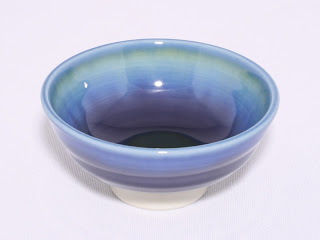 I like this Yasokichi Tokuda III because of it is a one of the best potters in the Kutani area. I really like its design and unique style. Wow ! I am really love in this art. He was really a great potters of city. It is such a marvellous different colours. Recruit your friends to help you search their 'hidden market' for available positions. the time, but I believed in myself.